In my reviews, I generally say very little about the narrators of an audiobook, and I have never started a review by talking about one: Own It by Michael and Hayley DiMarco is an exception to this rule however. I found myself wondering, in the first few chapters, which male reader had such an animated, basso voice and which female narrator has such an energetic while professional tone. I knew right away that I hadn’t heard either of them before or it would have stood out in my memory. Imagine my surprise when I found out it was the authors. I occasionally (okay perhaps more than occasionally) complain about how narrators don’t get the tone or nuance of the writer correct, but I understand since so many authors have such deplorable speaking voices. I was especially pleased with Hayley since too many female readers take on a sing-song quality that irritates me. I have to admit to a penchant towards avoiding female narrators when at all possible. Both authors did an outstanding job however. The DeMarcos’ book was as refreshing as their reading of it. The format of this book is unlike anything I have come across before. The first half of the book is written in a largely persuasive format. The authors seem to presume resistance from their audience. They regularly acknowledge their audience’s logic, trials, and counter-arguments in a way that is both engaging and entertaining. This quality alone makes this a book you would likely want to share with someone who is either considering entering the Christian faith or who is starting to have doubts about their faith. My one fear was that the author would be so excessively compromising and understanding that their book would lack the meat and conviction so many people need to hear. My worries were quickly set aside. The DeMarcos focus in on their theme of “saving faith verses imitation faith” early on. While they have a patient and respectful tone towards new or non-believers, they still pack their book with rich, valuable information. One of the most striking examples of this is how they seamlessly work scripture into the narrative. I caught myself, more than a few times, saying, “Hey that’s a Bible verse!” Rather than bombarding listeners with every proof-text imaginable, they regularly just work the biblical text into what they’re saying. They do this so well that I found myself really enjoying this technique, which surprised an old stickler like me. Towards the middle of the book, the authors accelerate like an Italian sports-car from persuasive writing into informative writing. I didn’t even notice the transition until the last third of the book and had to go back and listen for where it changed. The assumption seems to be, if you’re still listening to the book after a hundred pages that you either already agree with their position or that you are being persuaded. This was such a refreshing approach, since so many writers are able to only pursue one of these styles of writing. Own It was a revitalizing book that was over too quickly. I look forward to being asked to review another of the DeMarcos books in the future. Praise the Lord! After a lifetime of “You ought to” finally someone says, “Maybe you shouldn’t.” To date, I had never read a book by just Kevin DeYoung. 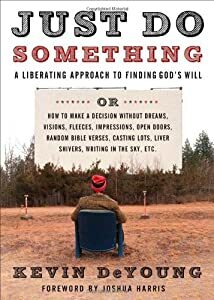 I always read, and was blessed by, books that he co-authored like Just Do Something and Why We Love the Church. These books were always good; however, they were missing a little something. I now know what that was, DeYoung’s wit and charm. I recently went back and re-listened to What is the Mission of the Church, and I am certain I can tell the areas where DeYoung was either the writer or the primary influence. He has a funny, endearing honesty that puts readers at their ease. He doesn’t present himself as a self-help guru. He doesn’t even present himself as someone who has conquered the problem of busyness. Instead, he shares how he himself struggles with the issues of time management and what he has to do to make time for what is important. What impressed me the most was that this book was neither some minor quick-fixes to time management (like setting a more selective email filter) nor was it a cheerleading session. If it was either of those I’d have been annoyed. What he looks at is how people in general (and in the church specifically) mismanage their time. The crux of what he shares is examining our reasons for what we do. Most prominent among these reason is pride. Why do we really do what we do and is it for our sake or God’s. He doesn’t purport to know our hearts, but he does clearly assert that we need to know our hearts. He also gets into many of the reasons that we lose those minutes and hours throughout the week. While the reasons he address are understandable; maybe even laudable, DeYoung encourages us that we have to set priorities and to make the hard choices so that we can offer our best to those things that we do best. This book isn’t meant for everyone. In most churches I walk into, I see 10-20% of the people doing 80-90% of the work. For that minority though, this book is essential. This book should be an encouragement to the leaders of the church to raise up new men and women to lead. Doing this will allow both the current leaders to do what they do best, and the new leaders to be blessed by serving the Lord. Perhaps the unsaid theme of this book is “be less of a worker and more of a mentor” so that all the church can know the blessings of service. Well before the end of this book, DeYoung’s sound arguments and clear examples had me evaluating my life. Immediately, I saw not only where I was overextending myself but also where I was just wasting my time doing things I thought as a pastor, father, and husband that I “ought to do.” I realize now, after reading this book, is that I was doing a worse job at all three, because I was doing what others thought was right for me rather than following my giftings in these areas of my life. I am already becoming a better-rested, happier, more attentive man than I was before reading this book. I, like Pastor DeYoung, still have a long ways to go; however, now I know what the actual problem is and can address it. While I’m not sure that Adam Verner got all the subtleties of DeYoung’s personality down in his reading of Crazy Busy, I do think that he did a good job of narration. He spoke smoothly and clearly throughout the book and read at a good pace. A writer that uses as many understated turns of phrase and ironic humor as DeYoung does has to be hard to read for. Across the board this was an excellent book not only to listen to, but to have on your bookshelf to refer to again-and-again. Dr. Nicholson is a member of the christianaudio review program. To learn more, visit christianaudio’s website at: http://www.christianaudio.com or Dr. Nicholson’s blog at drtnicholson.wordpress.com. In a reader’s life a number of books come and go. Some books are for study, some are read for the pure pleasure of it, and still others help us with the problems that loom ominously before us. On rare occasions, maybe once a decade, there comes along a book that does all three. It dazzles and delights us. We keep a special copy of it in easy reach to refer to it again and again. We recommend it to others, and we give it as gifts knowing that it will touch other lives the way in which it has touched ours. The Race Before Us, by Bruce Matson, is just such a book. Bruce Maton writes this book as he comes to a turning point in his life. He is about to turn 50 and while he has been a success, by all measures of the world, he knows something is missing. There’s a sense of “What’s next; where do I go from here?” looming in his not so distant future. He, like many people, has not only questions but also a dissatisfaction with the status quo that the world has to offer. There are 3 primary elements to this book. The first is a narrative about a middle-aged man looking to reclaim some of the athletic prowess of his youth. He does this initially out of a need to stave off the possibility of diabetes or even a heart attack. Over time however, he does it to reclaim something he lost: a sense of accomplishment and exhilaration that most of us remember for our youth, but that we shrug off as unattainable in later life. Bruce, as the protagonist and narrator of this story, is easy to relate to. He shares the very real struggles of somebody for whom running does not come easy. In the early part of the book, he brags to his wife how he was able to run for five minutes straight. He takes you along on a journey filled with pains and set-backs to arrive at his goal, running a marathon. This narrative will encourage and advise anyone wanting to get back in shape or be a better runner. If this was the whole story, this would be a pleasant enough book, but it’s not. The second part of this book is dealing with the sundry issues of middle-age. This element is interspersed throughout the book and comes off as a self-help book for those trying to get on track. He talks about health issues, of course, but he also deals with that sense of emptiness that many middle-aged people encounter. He shares his experiences and gives advice based on those experiences. He takes time to address the issue of a life that has flow by in the wake of education, profession, and children. He looks at what scripture says to those people asking “Is this all? Isn’t there something more?” This element is encouraging not only because of the scriptural support but because Bruce presents it in a way that sounds like a friend showing you his own vulnerabilities, not an expert offering clinical advice. The last element of this book was my favorite. Prior to each narrative section and intertwined with spiritual advice about mid-life is some of the most straight-forward yet challenging apologetics I have heard since C.S. Lewis. Bruce talks about the strengths and weaknesses of various theological arguments such as a-posterori, teleological, and cosmological. He gives hard, clear statistical proof of the claims he sets forth in all his arguments. He examines several of the major works of “a theists” and shows the tricks they use as well as the flaws in their arguments. His hard-hitting trial lawyer style sets his opponents back on their heels and leaves his Christian audience smiling at his successes. He explains many of the premises of intelligent design, including the anthropic principle and irreducible complexity in way that, while understandable, will challenge and expand the reader’s current understanding of theology and hermeneutics. He does all of this, and more, with a sense of wit, purpose, and passion that will carry the reader through the book. Bruce has more than written a book. He has offered us a chance to journey with him, and at the end of this journey we can find both hope and better understanding of our Lord Jesus Christ. In this book is something for everyone regardless of age, gender, or confidence in Christ and therefore should be read by everyone. However, if you are in a place where you are struggling; if you are asking what is next, pick up this book, find a comfortable spot, and start a journey that will change your life and perceptions deeply and forever. Jeff Goins does a good job of presenting an often overlooked issue in our society – living in the moment. So often people in general, and Americans especially, are concerned about what they are going to do once they finish college, after the kids leave home, or when they retire: Seldom are they concern about what God is doing in their lives right now as they sit at their computer reading a book review. One of the strengths of Gions’s book is its clear, logical structure. At the beginning of each section, Goins makes a point that he wants address as most readers do. Then he gives a detailed analogy that ties this point together in several different ways. This adds to both the ability of the book to relate to the audience and the scope of the audience the book reaches. He then ends with a summation of his point followed by what I liked best- a brief testimony of someone detailing with the exact point Goins was just discussing. This last element proved a saving grace for the book. Not only did this use of testimony break up the narrative and didactic writing of the book, but it also added credibility to what Goins was saying. Goins was 26-years-old at the end of writing this book (likely he still is since it was released 2 weeks prior to this review) and therefore many of his personal analogies were connected to his childhood and college experiences. While these are great, they limit the scope, depth, and reflection that are necessary for a book of this magnitude. Cleverly, he makes up for some of this by including testimony of people who have dealt with issues that only come along later in life. At the end of the book Goins tries to further close this gap talking about his experiences with death, but again it is a teenager (and then later young man) dealing with death causing it to lack real perspective. Probably my greatest criticism of this book is that there should have been not only more testimony but also that it should have gone into more depth. While Goins chapter structure was excellent, his overall structure was a little shaky. This is a normal transition that one might expect from someone who goes from blog writing (Gions’s specialty) to full-fledged, non-fiction, book writing. This is most apparent in the middle of the book when Goins talks about his experiences as a writer, what it takes to be a writer, and what that meant in his life. Again, this was not surprising to find in his book since it is a topic he often talks about, but it was only vaguely on point to the crux of the book. It ultimately came off as either something he had pulled in from another writing project to beef this book up to 179 pages or his book didn’t have a good through-point: Either way it’s a weakness, but one that is later overcome. Goins saves his book, and brings his points altogether, with his images of his newborn son. This allows him to explode out of the minimalistic issues of angst-ridden teen years and finding-myself college years. Here his book stops being for teens and starts being for a far wider audience. What makes this part of the book so compelling is that it captures how the hard, everyday challenges grow us into the person God wants us to be. While Goins doesn’t out-and-out state this, I think he touches on the idea that by embracing the little moments of growth throughout our lives we endear not only ourselves but also Christ to the unbeliever. The unbeliever definitely sees how we, as Christians, deal with death, the loss of a job, and persecution, but these instances are few and far between. What they truly see is the little moments – the moments when God breaks us and remakes us, one act at a time, into the person He wants us to be. They see the struggle and they see the growth and in the end (with a little luck) they see the Lord. This is a good book and if you have a hard time in the middle, hang in there, there are some big payoffs at the end. It is my firm hope that Goins comes back and re-releases this book in 20 years. If he does, I bet this book will shift from good to astounding.